This week saw the installation of the mechanical heat recovery ventilation system. Installing this system will mean that the rate of air change within the dwelling will be fully controlled at all time. The principal of the heat recovery’ ventilation system is quite simple. The system brings fresh filtered air into the dwelling and evenly distributes it throughout the rooms of the house whilst at the same time extracting the not-so-fresh air. However, prior to the not-so-fresh air being extracted, the system takes the heat from this air and uses it to heat the fresh filtered air coming into the dwelling, thus maintaining a constant heat within the house and reducing heat loss dramatically. Internally the plaster slabs are being installed. 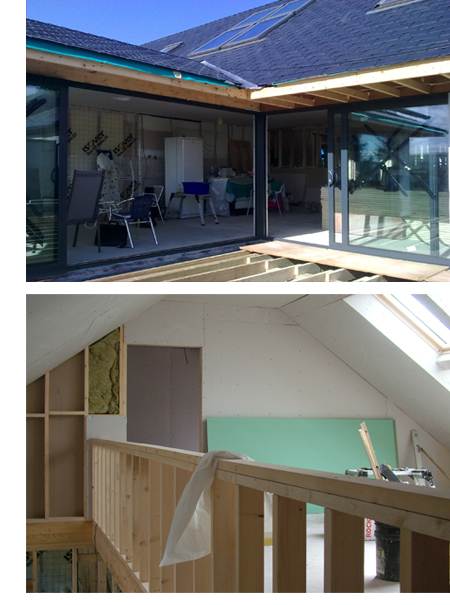 Once this is complete, the electrical and mechanical second fix and the finishes generally can begin.